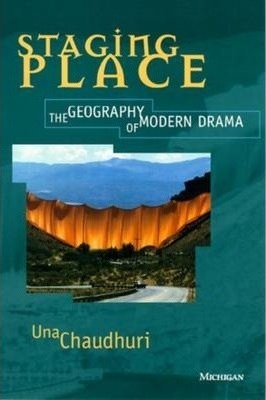 Staging Place: The Geography of Modern Drama reimagines the content and continuities of theater history and exposes underlying dialogues between "home and homelessness, belonging and exile"-a century-long struggle with the meaning and power of place, which the author terms "geopathology." By reading canonical works in conjunction with contemporary ones, Chaudhuri charts the evolution of a dramatic paradigm with profound theatrical and thematic implications. Chaudhuri starts with a discussion of a "poetics of exile" in early modern drama, where the figure of home is constructed as a locus of two conflicting impulses: the desire to find a stable site for individual identity and the desire to deterritorialize the self. By mid-century, she argues, a new discourse of "failed homecoming" begins to displace this geopathic model and replace the poetics of exile with a grim anti-poetics of immigration. She then employs postmodern and postcolonial theories of place and culture to define the emerging multiculturalism as a creative reworking of the figures of home, homecoming, homelessness, immigration and exile. Una Chaudhuri is Associate Professor of English, New York University.